Guruji Sri Narendra Babu Sharmaji, gave the details of Aachalapuram in his Sandyavandane Programme. As you continue to read, you will come to know the importance of this place, Thirugnana Sambandhar one of the nayanmars . Guruji Sri Narendra Babu Sharmaji, gave information of a Women who is 93 years old. This blessed women prepares food herself, without using any of the electrical appliances like mixers, grinders etc.. and offers it to the each every devotees who visit Aachalapuram everyday to seek the blessings of lord. Thirugnana Sambandhar one of the nayanmars was born in sirkazhi. He started reciting hymns on the Glory of Lord Shiva from his Childhood itself. He was Offered “Gnana Paal“ By the goddess parvathi through which he gained the divine knowledge. This is his first hymn and this is the first pathikam in Panniru Thirumurai . "Thoodudaiya cheviyan vidai eeriyoor thuuven madhi choodiKaadudaiya sudalaip podi poosy ennullam kavar kalvanEedudaiya malaran munainaat panindheetha arul seidhaPeedudaiya piramaapuram meeviya pemman evan andree"
He then went on pilgrimages to various sthalas. After visting a number of shrines, Sambandhar returned to Sirkali. He had reached his sixteenth year. His father wanted to get him married. Sivapada Hridayar father of sambandhar selected “Sthothra poornambika” daughter of Nambiandar Nambi of Nallur Perumanam as the bride. 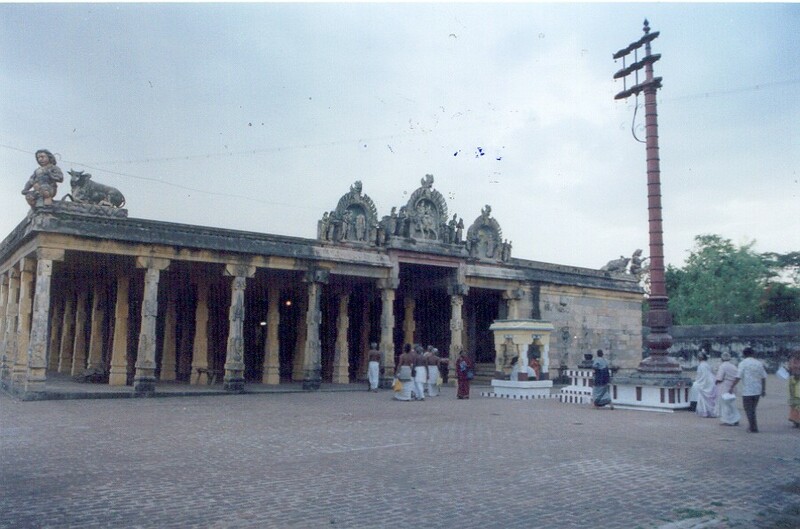 The wedding was to take place at Nallur Perumanam. On the appointed day, Sambandar went to the temple, worshipped the Lord and got His blessings. Accompanied by the devotees, the couple went into the temple and worshipped Him, with total self-surrender. Sambandhar sang a Padigam praying for Liberation. The Lord granted his wish and said: “You and all those who witnessed your marriage will merge in the Siva Jyoti and come to Me.” At once, an divine Light emerged from the Lord. Before merging in that Light, Sambandhar sang a Padigam known as the Panchakshara Padigam. Then all those who were there merged in the Light of Siva. Tiruneelakanta Nayanar, Muruga Nayanar and Tiruneelakanta Yazhpanar were also there! 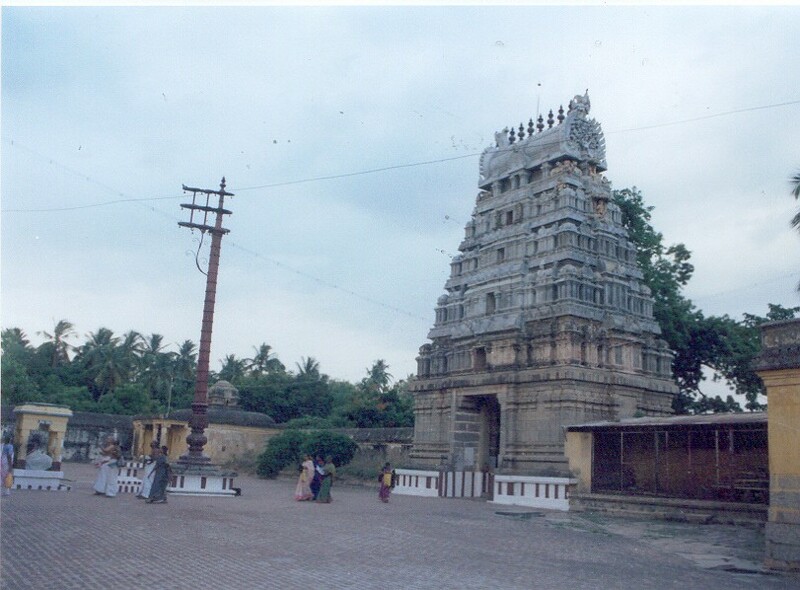 Thus this village holds the pride and name as “Mukthi Sthalam” . The lord here is “Sivaloga Thyagarajar” and goddess “Swetha Vibootha nayaki”. One of the special and interesting feature is that “Viboothi” is offered as prasadham in the ambal(goddess) sannadhi and the theertam here is "Panchakshara Theertham". The temple history says “Ganga (the holy river)” came to this temple to witness the marriage of sambandhar. Sambandhar blesses devotees here in “Kalyana Kolam” with his wife. 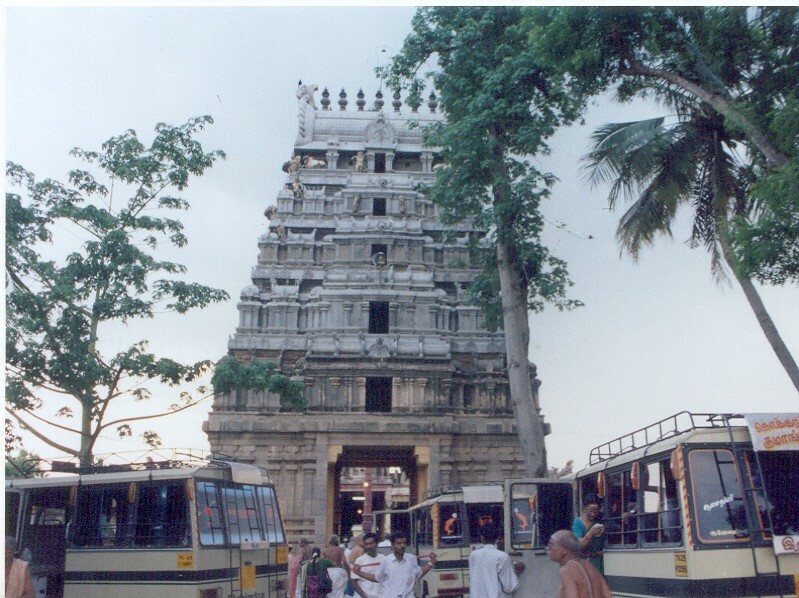 The nearest town is Chidambaram and one can reach this temple from there. 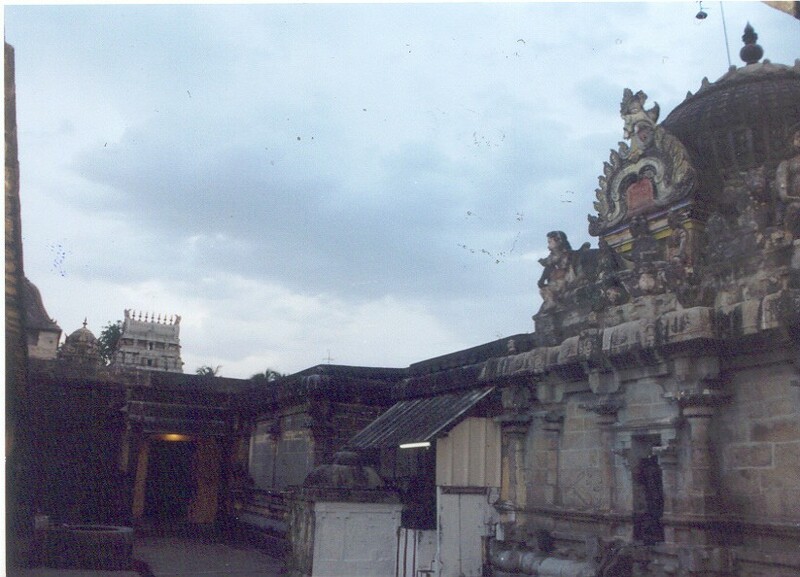 This temple has 2 prakarams & covers an area of an acre. 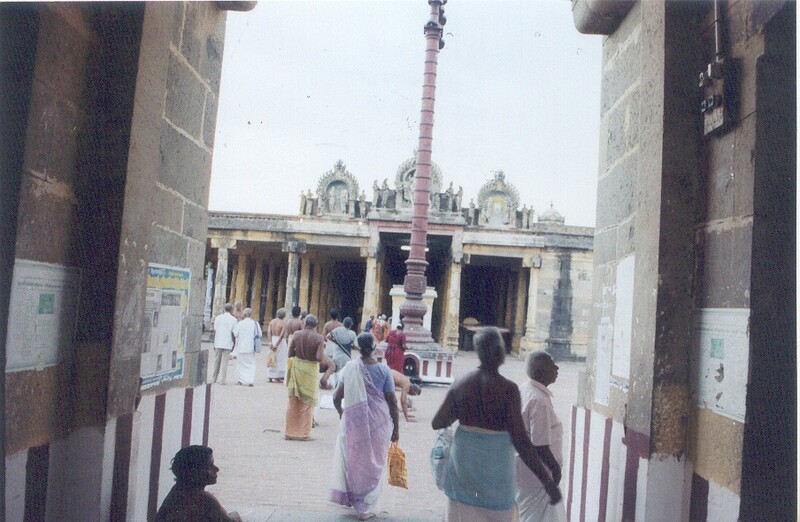 Tall walls line the outer prakaram and the entrance is crowned with a Rajagopuram. A 100 pillared hall in the outer prakaram houses images of Sambandar and his consort. The sanctum is decorated with 50 pillars exhibiting artistic stonework. Several Theerthams adorn this temple. This temple is administered by the Dharumapuram Adhinam. Inscriptions from the period of the Imperial Cholas (Raja Raja I, Vikrama, Kulottunga III, Raja Raja III) & Maravarman Parakrama Pandyan, recording endowments made to the temple are seen here. 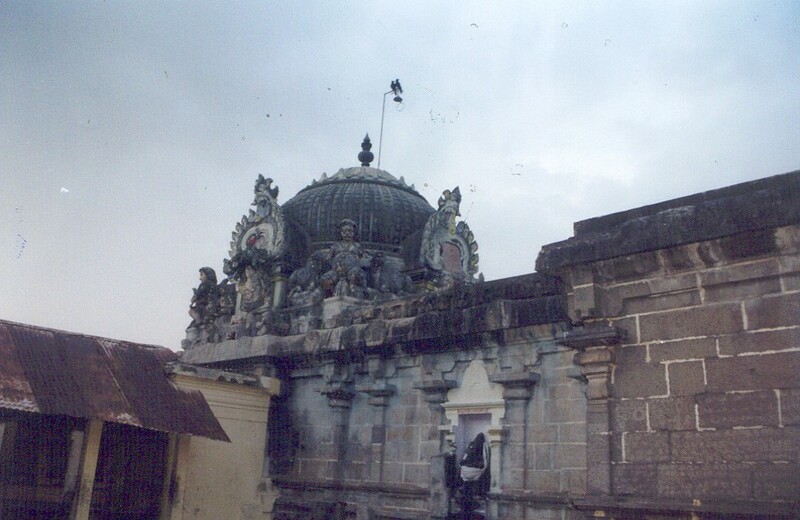 The Ambal shrine here was built around the year 1210 CE. One has to travel on Chidambaram - Sirkazhi road and reach a village called Kollidam after crossing the river Kollidam bridge. From Kollidam, one has to travel by a branch road that goes to Achalapuram and Tirumayendrapalli.This temple is located 8 Kms from Kollidam at Aachchaalpuram. Bus facilities are available from Chidambaram and Sirkazhi. Aachalapuram is about 25 Kms from Chidambaram. Dear Mohan, the temple energy may be on another plane. If you have pain it is you who allow this pain and forget about the great virtue of Siva's grace in letting these things going on. Don't worry, live in peace with Lord Siva blessings now. From Where and how can pain come then? Don't forget, The Lord is also in the music, in joy, in workers, in mud, in radio. The Lord is all of this. See the Lord everywhere. By not accepting what is there how can you really enjoy your life. You are responsible to unfold the divine purpose of Lord Siva on earth.